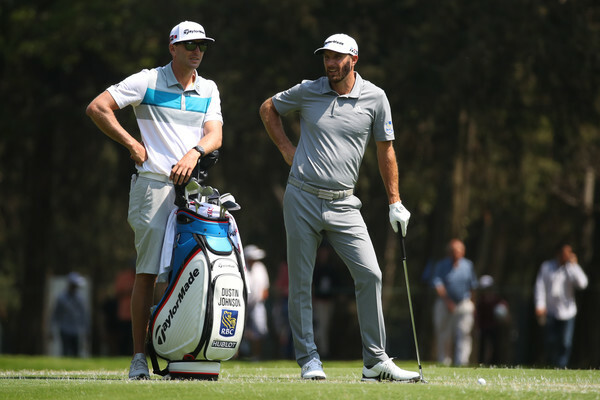 When it comes to short par 4s, there is no one that is more exciting to watch than Dustin Johnson. 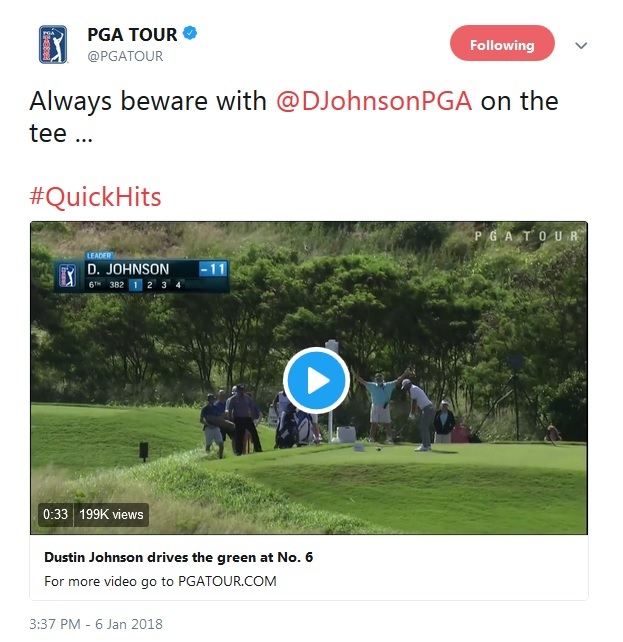 At Kapalua in January, DJ nearly aced two par 4s in the same tournament. 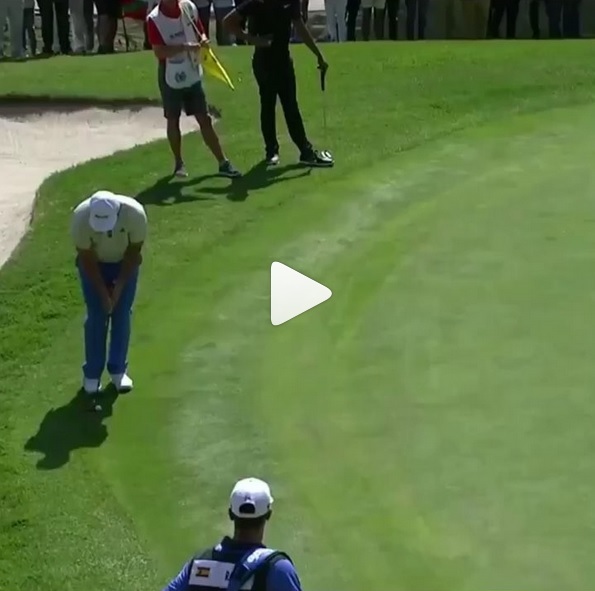 On Moving Day, he forced the caddie in the group ahead of him to yank the flagstick out of the hole after his tee shot from 382 yards away nearly found the bottom of the cup. And then approximately 24 hours later, DJ’s tee shot on the downhill 433-yard 12th finished literally just inches short of the hole. 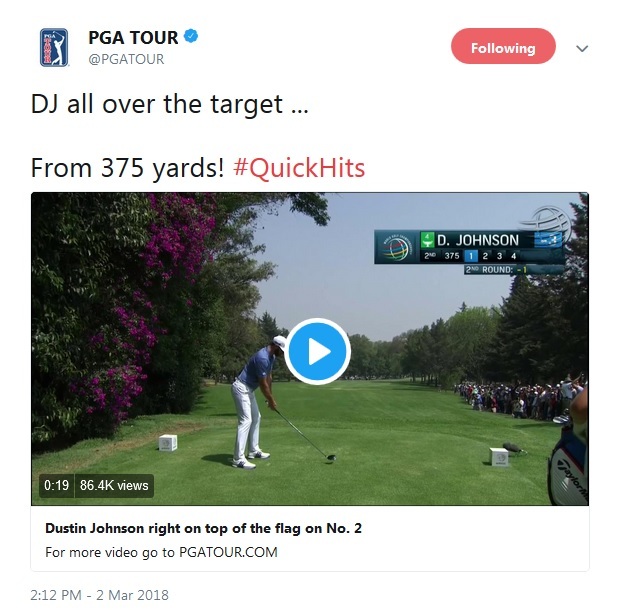 DJ’s short par 4 heroics are legendary. 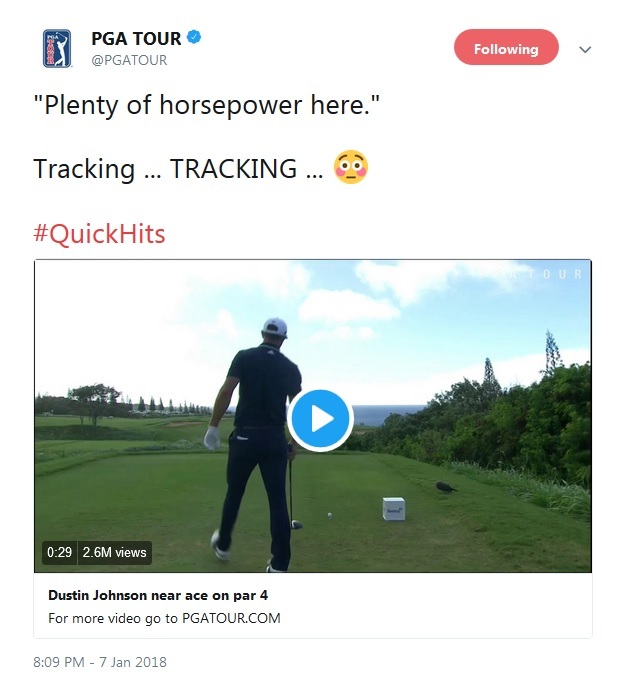 But what he did on the 375-yard dogleg 2nd at the WGC-Mexico Championship last week was just on another level entirely. Rather than play the dogleg like a normal human and lay up for a short approach shot, the World No. 1 took an aggressive blind line over the corner and nearly jarred his shot into the cup without a single bounce! That is the type of shot that you would normally only see in video games. 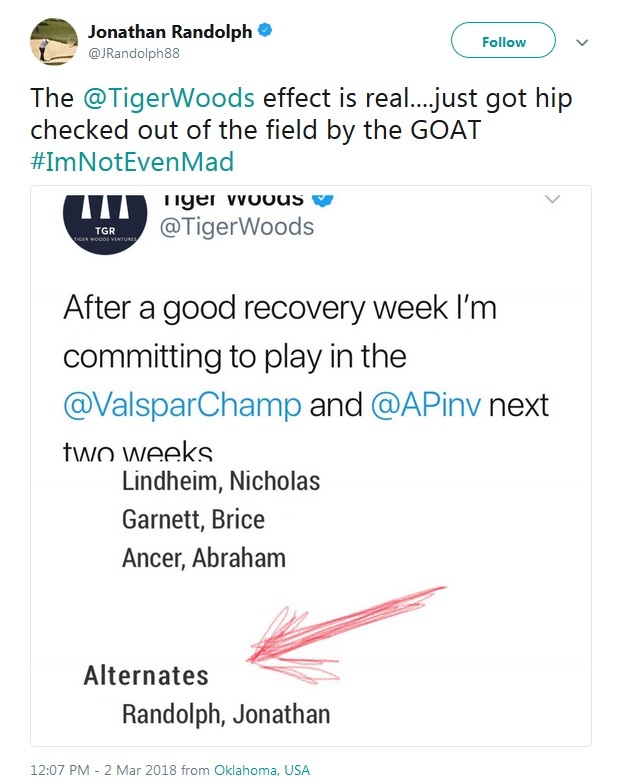 Tiger Woods fans who did not get their fill of the 14-time major at Torrey Pines, Riviera, and PGA National can rest easy. Tiger announced last week that he is adding two more tournaments to his schedule in order to fine-tune his game prior to the Masters. He will play in the Valspar Championship this week in Florida, and then make the trip to Bay Hill the next week to try to capture his ninth Arnold Palmer Invitational title. Tiger’s attendance at the Valspar is expected to bring in an additional 40,000 spectators over the course of the week. And tournament director Tracy West is reportedly preparing for this spike in ticket sales by reportedly opening up an additional two parking lots, hiring additional volunteers and security personnel, and ordering significantly more food, alcohol, and porta-potties. It appears that just about everyone in Florida is excited for Tiger’s debut at Innisbrook — even Jonathan Randolph, who was bumped from his spot in the field to alternate status after Tiger announced his intention to play. The UNLV Rebels followed up on their second-place finish at the NCAA spring season opener in Hawaii with a performance for the ages at the NIT tournament last week. The Rebels ran away with the title by 12 strokes after recording 86 total birdies and shooting a staggering 50-under par over the course of the 54-hole event. Rebels’ senior Shintaro Ban also took home medalist honours for the second time this season with a total score of 16-under par for the week. 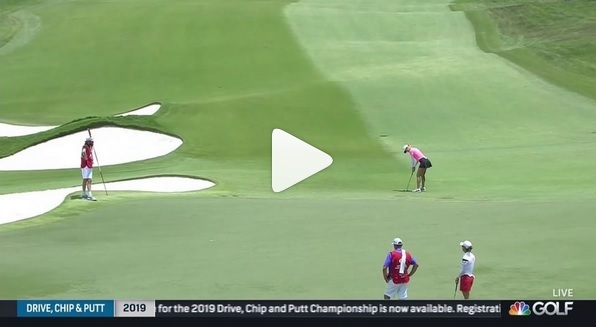 And it only seemed fitting that the team elected to wear red Oakley shirts throughout the tournament because those shirts matched all 15 of the team’s scorecards for the week. That’s right! 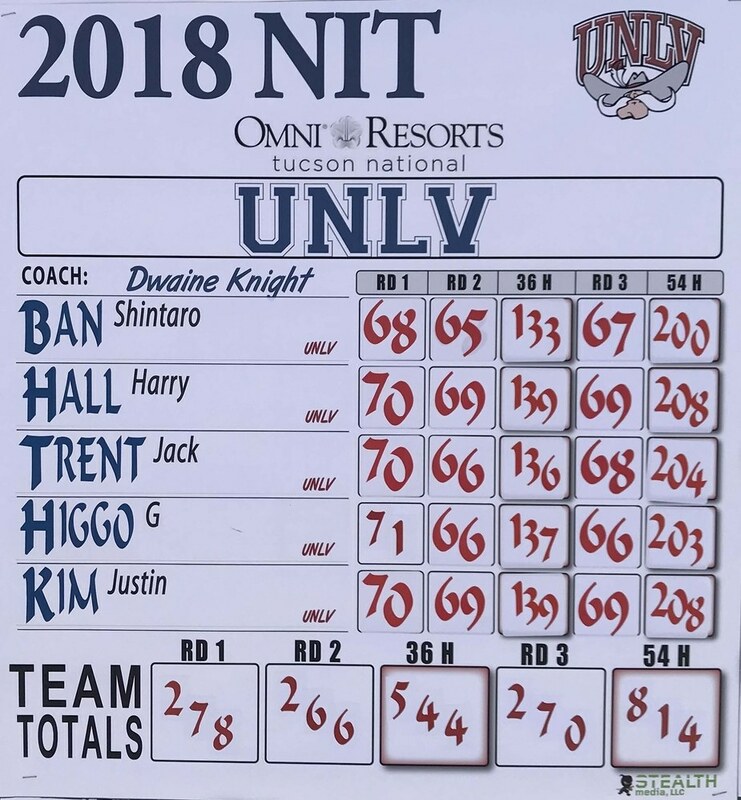 Each member of the Rebels squad scored under par in every round of the event, an achievement that UNLV’s hall of fame coach, Dwaine Knight, had never dreamed of in his entire 40-year career. “We’ve gone low before,” said Knight. “But never had something like this where every player broke par in every round.” Prior to the tournament, the Rebels were somehow unranked in the GCAA coaches’ poll. But that certainly won’t be the case for very long, especially if Ban and his teammates can continue to play at this exceptionally high level. 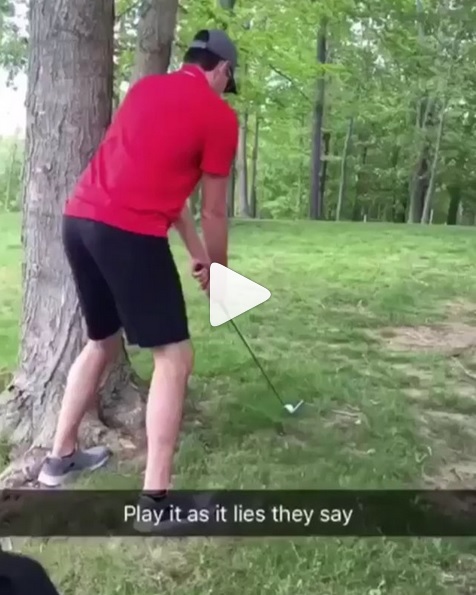 There are times when taking a stroke can be immeasurably wiser than attempting to hit an impossible shot out of the woods. This is one of those times! 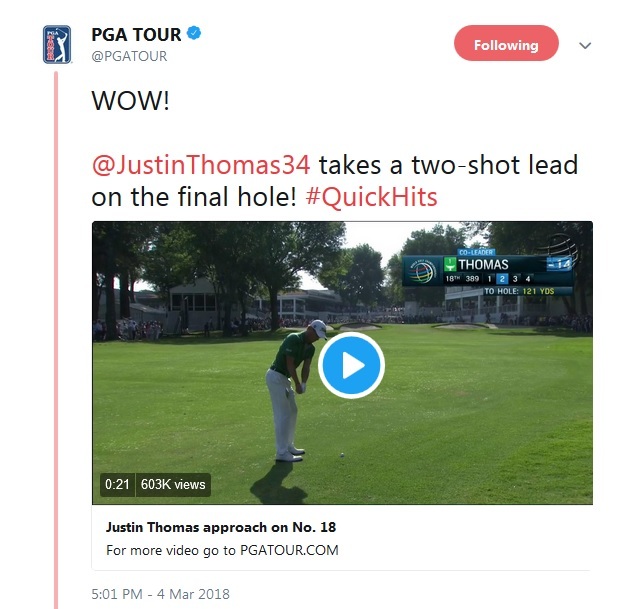 Unfortunately for Thomas, that shot was not enough to seal his first career WGC victory, as Phil Mickelson came storming back down the stretch and ultimately defeated the Louisville native in a playoff. Jon Rahm is the second ranked player in the world and one of the most promising young talents on the PGA Tour. But he looked more like Happy Gilmore on his first hole on Saturday when he four-putted his way to a double-bogey from just outside of 14 feet.